Work Support This mode enables a technician to adjust some devices faster and more accurately by following the indications on the CONSULT unit. DTC Work Support The use of this mode enables quick and accurate performance of Confirmation Procedure. Regarding items of DTC and 1st trip DTC, refer to EC-94, "DTC Index". 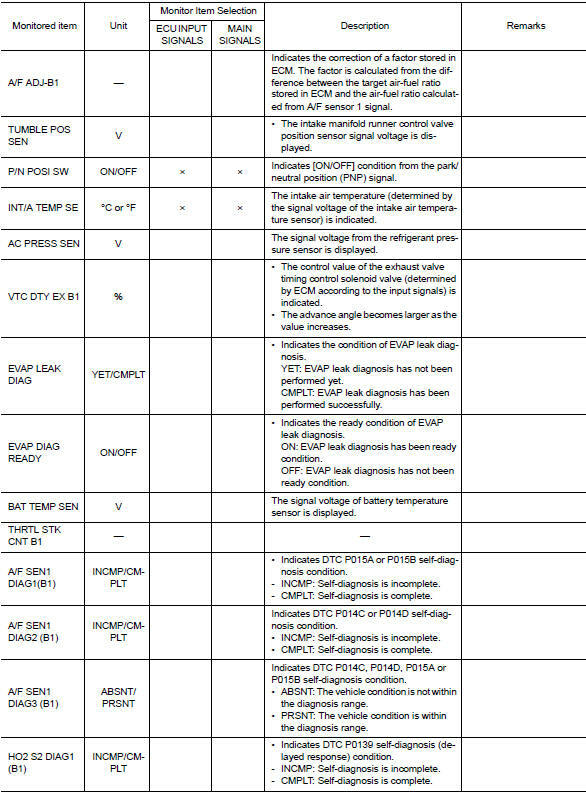 DTCs and 1st trip DTCs related to the malfunction are displayed in вЂњSelf-diag resultsвЂќ. When ECM detects a 1st trip DTC, вЂњ1tвЂќ is displayed for вЂњTIMEвЂќ. 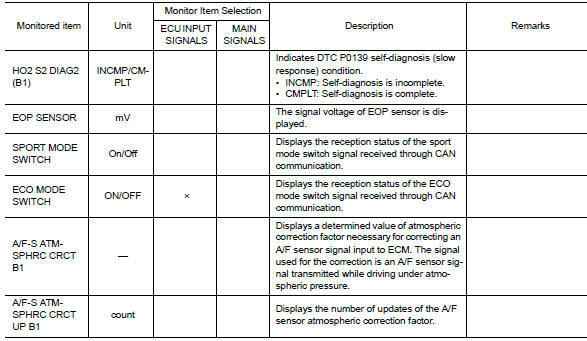 When ECM has detected a current DTC, вЂњ0вЂќ is displayed for вЂњTIMEвЂќ. If вЂњTIMEвЂќ is neither вЂњ0вЂќ nor вЂњ1tвЂќ, the DTC occurred in the past and ECM shows the number of times the vehicle has been driven since the last detection of the DTC. If the ignition switch stays ON after repair work, be sure to turn ignition switch OFF once. Wait at least 10 seconds and then turn it ON (engine stopped) again. If the DTC is not for CVT related items (see EC-94, "DTC Index"), skip step 1. Erase DTC in TCM. Refer to TM-105, "Description". 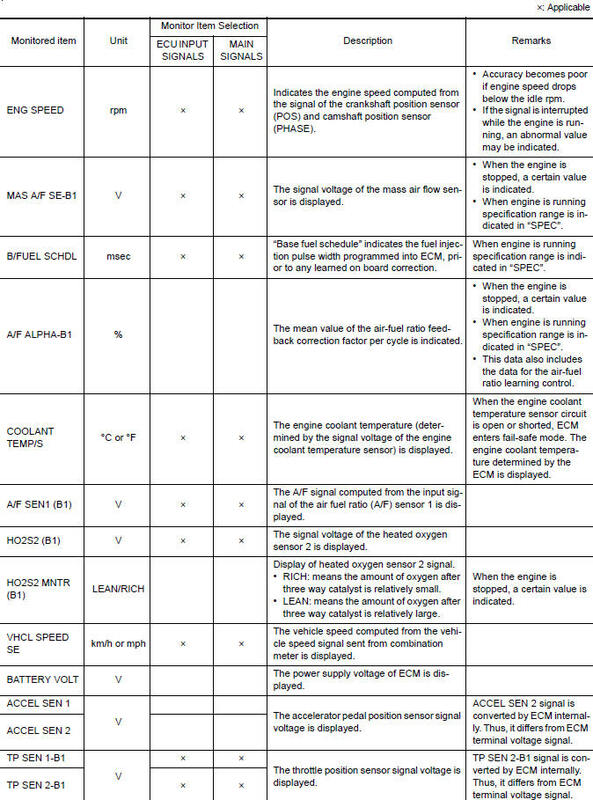 Fuel injection system statusвЂќ at the moment a malfunction is detected is displayed. CAL/LD VALUE [%] The calculated load value at the moment a malfunction is detected is displayed. 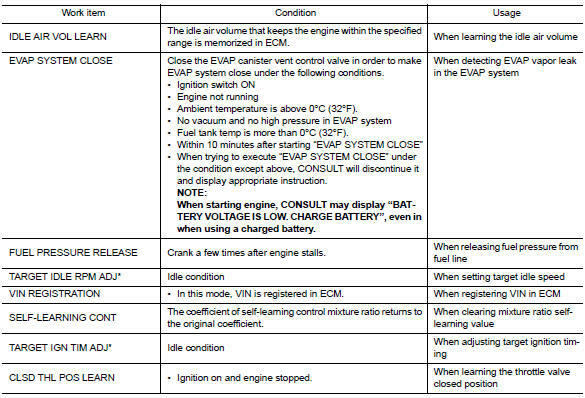 COOLANT TEMP [В°C] or [В°F] The engine coolant temperature at the moment a malfunction is detected is displayed. 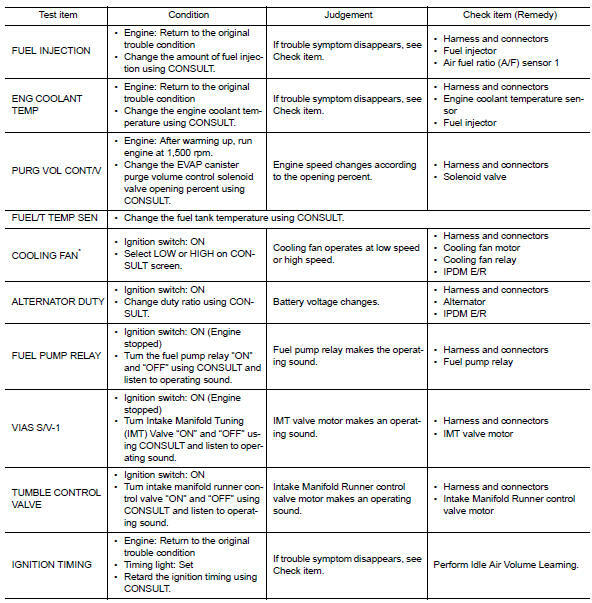 вЂњLong-term fuel trimвЂќ at the moment a malfunction is detected is displayed. вЂњShort-term fuel trimвЂќ at the moment a malfunction is detected is displayed. ENGINE SPEED [rpm] The engine speed at the moment a malfunction is detected is displayed. VEHICL SPEED [km/h] or [mph] The vehicle speed at the moment a malfunction is detected is displayed. ABSOL THВ·P/S [%] The throttle valve opening angle at the moment a malfunction is detected is displayed. 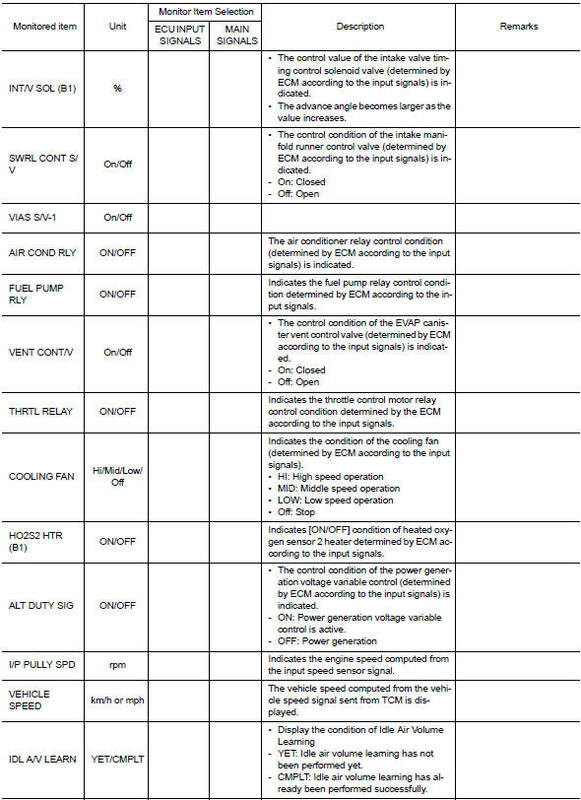 B/FUEL SCHDL [msec] The base fuel schedule at the moment a malfunction is detected is displayed. INT/A TEMP SE [В°C] or [В°F] The intake air temperature at the moment a malfunction is detected is displayed. FUEL SYS-B2 These items are displayed but are not applicable to this model. For reference values of the following items, refer to EC-77, "Reference Value". *: This function is not necessary in the usual service procedure. 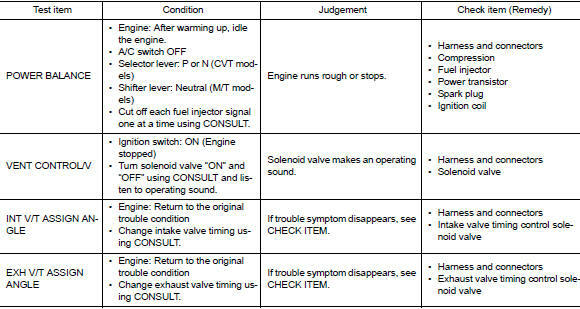 *: Leaving cooling fan OFF with CONSULT while engine is running may cause the engine to overheat. 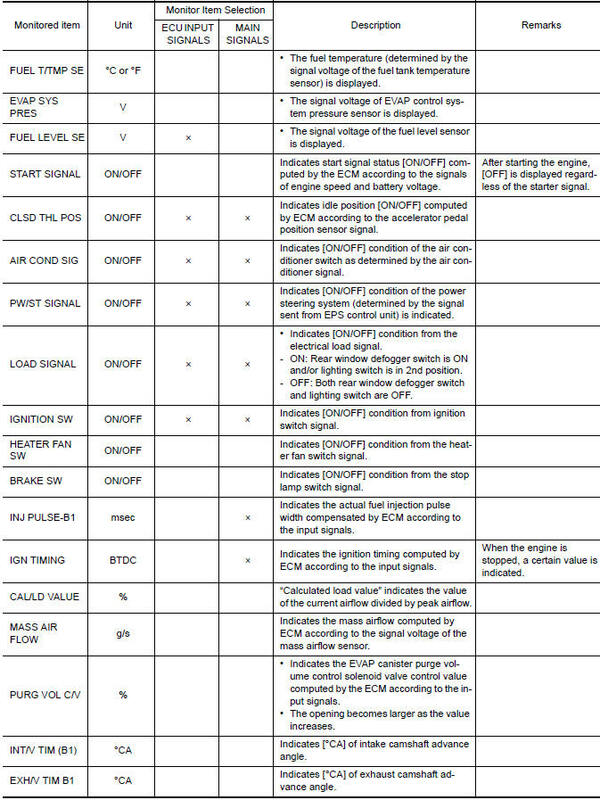 For items whose SRT codes are set, вЂњCMPLTвЂќ is displayed on the CONSULT screen; for items whose SRT codes are not set, вЂњINCMPвЂќ is displayed. вЂњSRT STATUSвЂќ provides the presence or absence of permanent DTCs stored in ECM memory. Select вЂњPERMANENT DTC STATUSвЂќ in вЂњDTC & SRT CONFIRMATIONвЂќ mode with CONSULT. Permanent DTCs stored in ECM memory are displayed on the CONSULT screen to show if a driving pattern required for erasing permanent DTCs is complete (CMPLT) or incomplete (INCMP). Since the вЂњPERMANENT DTC STATUSвЂќ screen displays the previous trip information, repeat the following twice to update the information: вЂњIgnition switch OFFвЂќ, вЂњWait for more than 10 secondsвЂќ and вЂњIgnition switch ONвЂќ. This mode is not used in regions that permanent DTCs are not regulated by law. 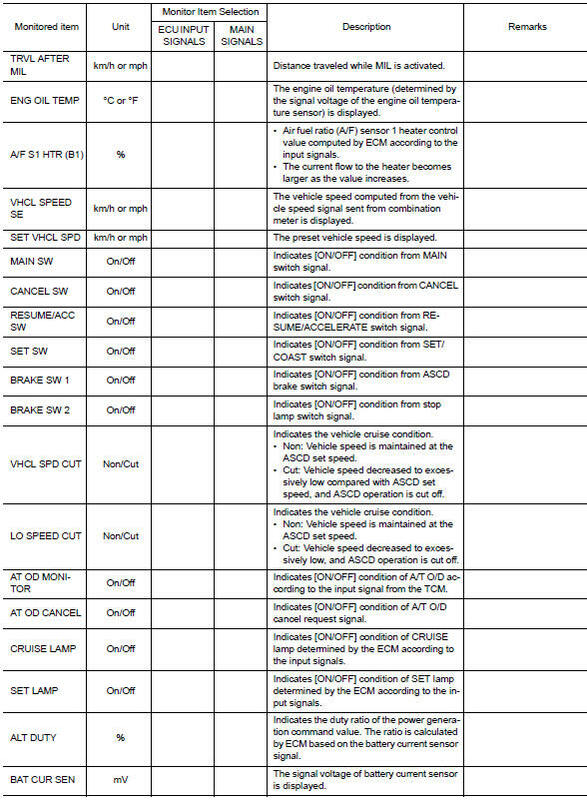 This mode enables a technician to drive a vehicle to set the SRT while monitoring the SRT status. This mode enables a technician to drive a vehicle to complete the driving pattern that is required for erasing permanent DTC.